Aren't you stressed out with all those essays you have to complete? Don't you just wish for the smartest writers to work on your papers? You're in a situation that every Aussie student has faced at one point or another. We are a nation that's all about freedom and flexibility. When dealing with academic writing assignments, we feel like the educational system has limited our potential by forcing us to fit into the standards. Yes: academic writing is important for every profession, but you simply can't handle so many assignments in so little time. Is there a solution? Of course there is! 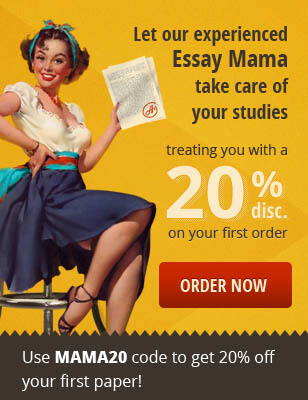 EssayMama is the best assignment writing service in Australia, specialized for Aussie students. We have hired native Aussie writers who hold degrees from top universities. Are you ready to start getting better grades? All you need to do is hire an essay writer at our website. Wondering How You Can Hire Our Australian Essay Writing Service? That's the easiest thing in the world. Our ordering, completion, and delivery procedure won't cause any stress. Start by filling in our order form. Please, be as detailed as possible and provide all guidelines for the content you want to get. Once you place the order, you can allow the best essay writing service to handle it. We connect our customers with the writers of their projects. You'll get a chance to observe the work of your writer. Is there something you don't like? Maybe you get a new idea for the thesis statement or arguments? Feel free to talk to the writer. You'll get your paper by the deadline. We understand that when you buy essays online, you expect to get the content by the deadline you specify. We have a strict policy of timely delivery and we are never late with the completion of the orders! As you can see, it's easier than ever to get a top-notch paper exactly when you need it. Don't forget: we also enable each customer to get free revisions until full satisfaction. Plagiarized content from books, journals, online articles, or other sources. Pre-written papers that have been delivered to other students before. Unlike other writing services in Australia, EssayMama never relies on the above-listed practices. Each and every paper is completed from scratch. We pay attention to every single detail in the customer's instructions and we deliver content that meets their requirements. Rest assured that your paper will be 100% unique when you order it at EssayMama.com. Your teacher will never suspect you weren't the one who wrote it. If you take a look at the prices of other custom essay writing services in Australia, you'll notice that these companies try to convince you that high-quality academic writing costs a lot of money. Of course we value the efforts of our writers too, but we have created a balanced pricing system that enables our writers to get what they deserve without burdening you with an unreasonably expensive price. Check out EssayMama's pricing system and you'll be convinced that you can finally get affordable and reliable Australian style essay writing help without going broke. What are you looking for when you decide to get online assignment help in Australia? You need top quality, low prices, and a straightforward ordering process that won't consume much of your time. You already know you'll get all that at EssayMama.com. However, you'll also benefit from the ultimate level of professionalism in this industry. When you get college essay help at our website, you'll have access to 24/7 support system. The agents will answer all questions without making you wait. We recommend you to use the online chat feature as the most convenient option to get immediate responses. Are you stuck with a research paper, a plain essay, a complex type of essay, or an entire dissertation? It doesn't matter; you can count on us in any case. You won't have to look for different paper writing services in Australia to order projects for various courses; our team can handle any academic challenge. The best part is that we will format your project according to the standards of academic writing at Aussie universities. Your writer will reference all sources according to the required citation style. In addition to writing services, we also offer editing, proofreading, and formatting assistance. When you write your own paper, but you want to get it flawless, you can simply submit it at our website and you'll get it back in its perfect version. Our customers often ask: "What's the secret to your success? What makes you able to deliver the best Australian essays? " There are several factors that contribute to our company's status in the industry. First of all, we have the best, most versatile writing team of MA and PhD experts. We offer ultimate support, reasonable prices, and simple ordering process. When all these factors are combined with our guarantees, you get the most convenient experience. However, there is something else that makes us special: collaboration. We allow you to become part of the process of completion, so the final version of the paper will convey your own opinions and ideas. Now you must be thinking "I finally found the perfect company in Australia to do my assignment" You're right! Are you ready to delegate your challenging assignments to the best authors? Do that today!